I am absolutely thrilled with this and can’t wait to receive my official letter, certificate, and badge. This has been a great start to 2017 – but I’ve got a lot more planned. There are 3 levels of membership at The Magic Circle. Magicians who wish to join may spend up to two years as an Apprentice before applying for full membership. They need to have known two current members for at least one year. These two members are then asked to act as sponsors, or referees, on an application form and propose him/her as a suitable candidate for membership. Following the receipt and processing of the application, the candidate is invited to an interview with the examinations secretary. If the candidate proves suitable and sufficiently knowledgeable a performance exam is scheduled or a thesis may be written. The final stage is by vote by members of the Council, who will approve the candidate as a member. Once the applicant is successful, they are free to call themselves “Members of the Society” and use the letters M.M.C. after their name. Members may take a further examination to achieve the degree of Associate of the Inner Magic Circle. The designation A.I.M.C. shows this higher membership. The A.I.M.C. degree can be attained through a thesis, or a written exam scoring 90% or above. Those who attain an A.I.M.C. degree as a result of a performance examination are awarded the A.I.M.C. with silver star. Within the society, there are a number of members never exceeding three-hundred known as the “Inner Magic Circle“. 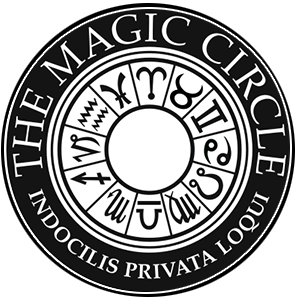 Full membership of the Inner Magic Circle is denoted by the letters M.I.M.C. after the member’s name. Membership of the Inner Magic Circle is by call of The Society’s President. The M.I.M.C. degree may be awarded with a gold star, to signify that the recipient is a performer of magic (as opposed to e.g. an inventor, historian or noteworthy volunteer for the Society).